Newsarama: Late last month we got the news that Venom was ending with October’s #42. Cullen, when did you find out and what are your thoughts on the conclusion? Cullen Bunn: I got the call that the book would be ending a few months ago. 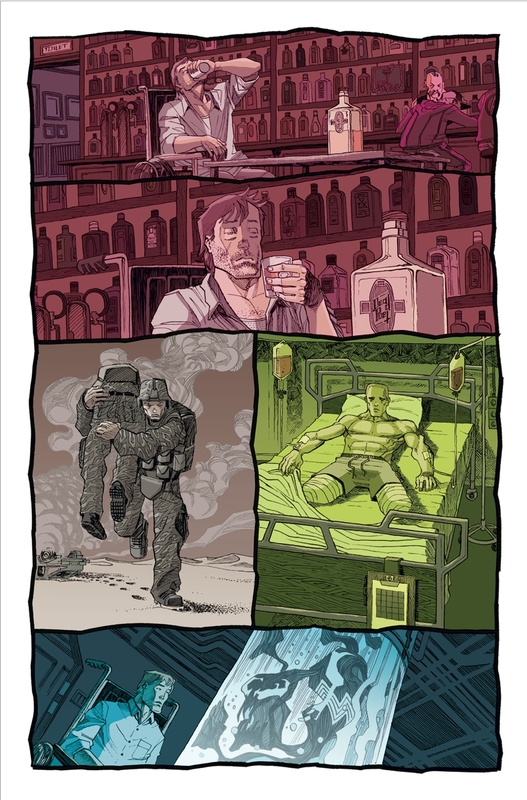 It was disappointing to me, because we were coming off the Toxin arc, which got a pretty strong fan reaction. And I had just started writing the first Mania issues of the book. I think the writing was on the wall for me, though. I don’t pay much attention to sales figures, but a lot of fans (or more specifically anti-fans) take great delight in e-mailing or tweeting or otherwise crowing about the numbers. But I was still hopeful. I still had a much, much longer story in mind. So it knocked me for a bit of a loop. These things happen, though, so I did my best to roll with it and wrap up a few loose ends. Nrama: Given the quick turnaround nature of comics, did you have a chance to work on these final issues to tweak them now that they’ll be the series finale- especially given the promise of a Mephisto appearance in the solicits? Bunn: I had a story in mind for issues 37 – 42. It was always intended to be Mania’s origin. I tweaked a few things to wrap a few (but not all) of the loose ends up with Venom #42. A few elements were rolled into this arc that weren’t originally intended, but for the most part it is pretty close to what I had originally intended. Nrama: Between you and Rick Remender, by the end of this you’ll have carved out a healthy two and a half year, 42 issue run of Flash Thompson as Venom. Although his series is ending, do you think Flash Thompson-as-Venom’s story continues? Bunn: I’m certain the story continues. I know a few of the things that are in the works for Flash, and it’s pretty crazy and exciting stuff! Nrama: Speaking of exciting stuff, this month’s Venom #40 is really showing off Flash’s student Andi in her new guise as Mania. For those who might be behind a couple issues, what can you tell us about her? Bunn: Well, Mania first appeared in Venom #38, so by now most readers know that she is Flash Thompson’s student and neighbor Andi. She gets caught in the middle of a fight between Flash and Jack O’Lantern. Flash tries to protecther during the fight and somehow… symbiofies… her. She suddenly finds herself saddled with a symbiote very much like Venom. The strange thing is, she seems to bond with it much more quickly than Flash ever bonded with Venom. The mystery, of course, will be how the Venom symbiote spawned Mania. We’ll be answering that question in the final arc… in Venom #42 specifically. 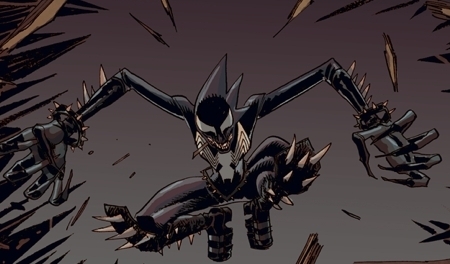 Nrama: Each symbiote has shown its own unique powers – what can you tell us about Mania’s? Bunn: Mania is very similar to Venom… and there is a reason for that… but she will have some gifts that will be a little unexpected and confusing for everyone involved. These gifts will also make her the target of some very bad folks. Nrama: Part of me says that Flash isn’t the type for a sidekick, thinking about Mania – but in a way he’s always had one with the symbiote. How does Flash feel about having a partner? Bunn: At first, at least, he doesn’t see Mania as a partner. In fact, he directs a lot of energy toward separating her from the symbiote. But as they begin to work together, their relationship will change quite a bit. I think it will be an interesting progression from where Flash started. It’s also something I’m a little heartbroken that I won’t be able to explore further. But I think Venom #42 leaves Flash and Andi in a very interesting place. That issue is gonna be crazy and action-packed, but there is an undercurrent that makes the issue very personal to me. Nrama: In addition to showing Mania in full bloom, the most recent issue also brought Damion Hellstrom back into the picture – as well as D.O.A. What can you say about this? Bunn: Hellstrom is showing up again, but he’s still locked up. He’s not running with the D.O.A. right now. In fact, he’s probably pretty glad he’s behind bars once he figures out what the D.O.A. is up to. Hellstrom is an interesting conundrum. He “went bad” in Fear Itself: The Fearless, but he showed up in several other comics around the same time. And he was portrayed in vastly different ways in each book. I promised readers I’d make sense of that, so I’m doing so in the final arc. Nrama: After facing down some real monsters in previous issues, the solicits for Venom #41 promise not only a face-off with Lord Ogre but also Crossbones. What can readers expect? Bunn: A lot of blood. Mania and Venom versus Lord Ogre will not be pretty. 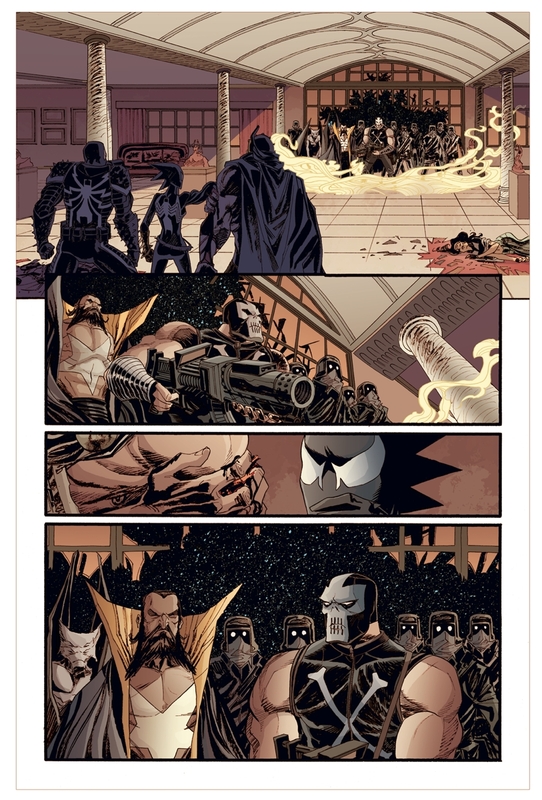 Venom versus Crossbones will be even less pretty! Nrama: And as mentioned earlier, the series finale Venom #42 promises a rare appearance by Mephisto. 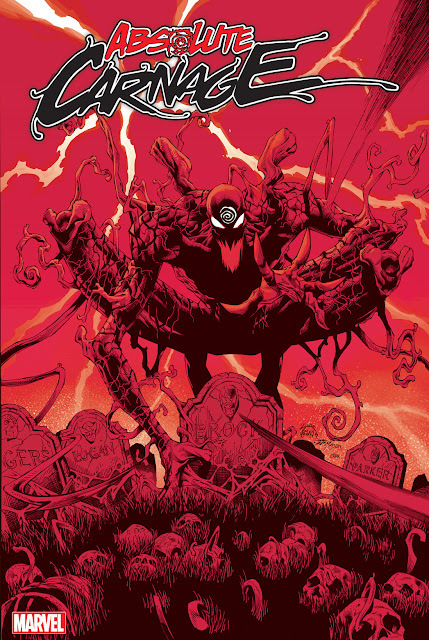 Before I even get into the why and the hows, can you tell us about your impressions of Mephisto – especially given your other stories about demons in things like Sixth Gun? Bunn: In my favorite depictions of Marvel’s Mephisto, he’s the most charming of demons. He’s the guy who seems like he cares about your well-being… while he’s carving out a condo for your soul in Hell. He’s the grinning, friendly demon who can come across as your best friend... right up until the point when he rips your spine out. 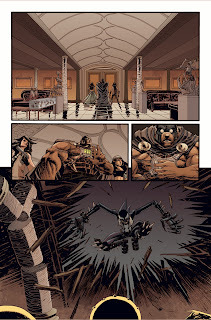 Nrama: Last question, Cullen… Enough beating around the bush – what does Mephisto want with Venom here? Last time he crossed one of Marvel’s spider-family heroes, things didn’t turn out so well. Bunn: Ah ha! What does Mephisto want with Venom? Well, we already know that the demon has marked Venom as one of the possible heirs for a throne in Hell. But in this case, the story isn’t going to be about what Mephisto wants from Venom as much as what Venom wants from Mephisto. But neither one of them is in the deal-making mood.